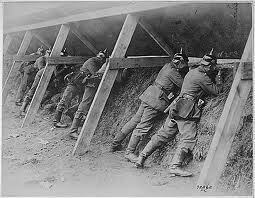 Trench warfare in World War 1 was a result of the inability of the belligerents to sustain any offensive strategy. Gains were measured in yards rather than miles. Technology of fire power was greatly advanced, but the technology of mobility lagged far behind. Before the first year of the war passed, the words stalemate and attrition, in three languages, were the topic at all general staff meeting. Trench was a synonym. The western front was an approximately 100 mile north/south line that stretched from the North Sea coast of Belgium southward crossing into the north of France. A new line then snaked eastward across France to the Swiss border and was heavily fortified. Much of the north/south line was exposed to the underground encroachment of the sea. As a result of that proximity, the ground had a very high water table. It is in this soil that the belligerents dug their trenches, and the shells of their big guns created a landscape of water filled craters and excavated trenches filled with water and mud. Although there were battles on an eastern front where Austro-Hungarian forces faced the Russians, and in the far east British and French troops matched against Ottoman forces, trench warfare was not as expansive as on the western front. On the eastern front, heavy snows discouraged digging trenches, and in Turkey, the area was so vast that trenching could not prevent attacks on the flanks and protection was sought behind ancient walls, sand dunes and rocks. "No one knew why they were there or where they were to fire-they just lay there and were shot and left". The German army swept through most of Belgium until they reached the city of Ypres and the line of trenches dug by two British divisions. Each side sought control of this Belgian city that influenced the defense of the English Channel and the North Sea.The British held, but suffered 130,000 casualties. This was a wake-up call for the home front dream that the soldiers would be home for Christmas. Significantly, German forces held the high ground where they installed their trenches gaining a higher water table and a better view of the water logged Ally trenches.The German bombardment began in November 1914. It was indiscriminate and spared no civilians. German Admiral Tripitz with unbelievable naivete wrote his wife about the Belgians: "It really is extraordinary how very unpopular we are". 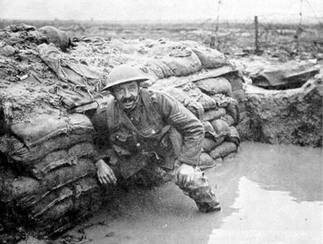 Military trenches have a 2,000 year history. Roman soldiers built them around their camps as did Americans in their Spanish American Cuban campaign. They were used in medieval times to attack fortifications. 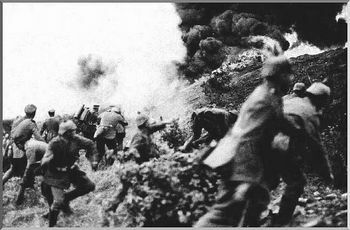 However, they were not subject to attacks of poison gas, huge artillery shells and machine guns. That dubious honor was reserved for the infantry on the western front. 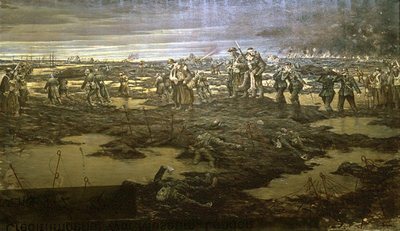 In the early autumn of 1914, a line of opposing trenches were dug in Flanders that set a low bar for the lives of infantrymen for the better part of five years. The trenches, relatively open to inclement weather conditions, housed and fed the opposing armies sometimes as little as 100 yards apart separated by belts of barbed wire that dotted an uninhabited no-mans land. Initially, there was a wire shortage. Some troops "requisitioned" agricultural wire from surrounding villages. Often that wire was not barbed. The home fronts rapidly addressed the shortage and hundreds of square miles were layered with new, heavily barbed wire. At first, the wire belts were laid every 5 to 10 yards, and then, later, even more dense concentrations were constructed. The British rule of thumb was to lay the wire 9 meters deep. In 1915, the British and French High commands concluded that the trench stalemate could only be broken by mass attacks. They had noted that their Asian ally, Japan, had successfully employed this strategy in the Pacific. The belligerents were totally unprepared for hundreds of thousands of fighting men to remain immobilized, in squalid conditions, for months at a time. Ultimately, they developed a rotation system that would relieve front line soldiers for rest and relaxation (R & R) for short periods in rear, safer areas. When the United States forces entered Europe in 1917, their first taste of battle and trench warfare was their insertion into French or British lines as replacements during periods of troop rotation, or to fill depleted ranks. Both President Woodrow Wilson and General John Pershing objected to Americans serving under foreign command, and under a foreign flag. 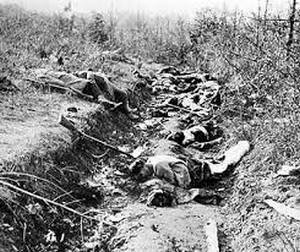 It would not be until September 1918 that Americans fought under their own command in the battle to destroy the German salient at St. Mihiel. The American troops followed Allied tanks and eliminated the German presence that had been entrenched there since 1914 behind a once impregnable Hindenburg Line. Store rooms and dugouts were tunneled into the sides of the trenches. When available, corrugated metal served as a roof to protect against shrapnel blast. Steel helmets served a similar purpose although could not stop a direct hit from a bullet. The banks of the trench were packed with sand bags to protect against soil slides. 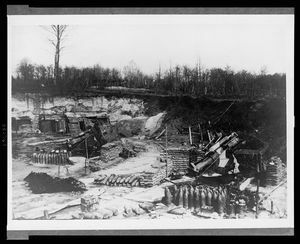 The Germans built a system of sophisticated trenches that featured multiple defensive lines at depths that were inpenetrable from bombardment except by direct hits. The trenches were laid out in a jagged pattern to avoid attacks on the flanks. 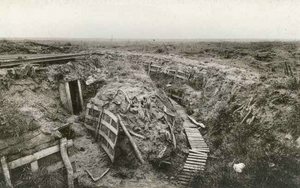 On the other hand, the Allies built trenches as though they were temporary and afforded only passing shelter from weather and bombardment. The trenches were considered death traps by the French. In 1917, numerous battalions rejected orders to march to the front line trenches. This was a mutiny by any other name. In that year, the news on other fronts was bleak. The Italian ally was making no progress against the Austrians. The Russian government was collapsing and so were their efforts on the eastern front giving the Germany army breathing room. In the Near East, there was little progress to wrest Syria from the Turks despite some minimal successes from the revolting Arab tribes led by the irrepressible Thomas Edward Lawrence newly promoted to major with nary one day of military training. His fame as Lawrence of Arabia had spread from Cairo to London. The front lines were connected to the rear through communications trenches that zig-zagged their way to the rear. There were also fall back trenches in the event of a retreat from the front line. The stench of rotting corpses in the no-mans zone was pervasive. Rats invaded the trenches and fed on corpses. Lice infested the soldiers uniforms. One remedy was to lay an infested jacket over an ant hill. It was deemed easier to kill the ants then rid the garment of lice. Life in the mud was endless. The trenches were referred to by the soldiers as "open graves". Death came in many guises. Shells from the big guns, small arms fire, bayonets in frontal attacks, poison gas, disease, trench foot from the ever present water, and life long chronic effects from "shell shock". By the end of 1916, the British had suffered 400,000 deaths. The German army sent its recruits into battle only after vaccination for typhus, diphtheria, and cholera. The men in the trenches were forewarned that they were expected to "go over the top" after their big guns had extensively shelled the enemy forward trenches. 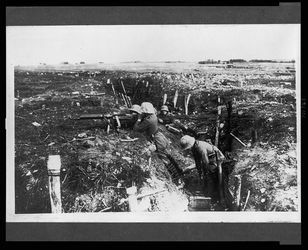 By 1916, the Germans were constructing some very deep elaborate trenches with a heavy emphasis on their machine gun squads. Some of these squads would, under the cover of darkness, occupy shell craters in no mans land, and surprise an attacking enemy force with devastating effect. When trench lines were established, there were a variety of tactics employed to destroy the line. 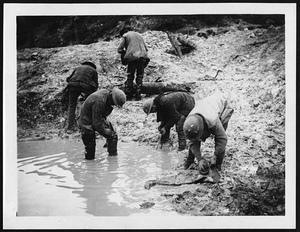 One method employed sappers who dug tunnels under no-man's land and set off explosives under or near the enemy trench. Neither these efforts or massive frontal attacks and week long bombardments were effective. 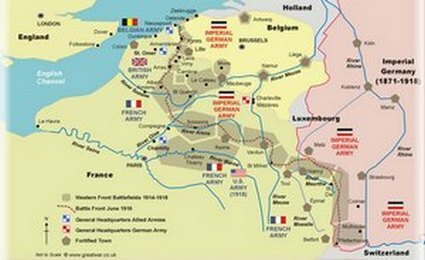 In 1915, the British and French High commands concluded that the trench stalemate could only be broken by mass attacks. 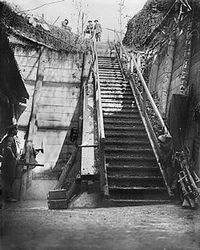 The British and French had noted that their Asian ally, Japan, had successfully employed this strategy in the Pacific, but proved relatively ineffective against German trenches when gains were measured in short feet and yards. The basic pattern followed by both sides was the frontal attack that relied on the rifle, grenade and trench mortar. The attack would be preceded by a creeping barrage that acted as an umbrella for their troops attacking the front lines of the enemy. It took several years of huge casualties, highlighted by five months at Verdun in 1916 of 600,000 combined deaths, to reveal the obvious. Massive frontal attacks by either side were ineffective. The German 5th Army could not budge the entrenched defensive positions and the ring of forts that formed the French salient extending into the German lines. In July of the same year, British troops overran the German trenches at the Somme only to be dislodged by a German counter attack. United States General, John Pershing, landed in France in 1917. Despite experiences of his allies at Verdun, his core belief was that massive attacks would bring the Germans out onto the field and defeated in open combat. This tactic to end the trench stalemate, and the companion belief that the war could not be won by attrition, was ultimately tested at Belleau Woods in June 1918. What price victory? It resulted in 9,000 United States casualties, and a permanent cemetery for American dead. The major problem with the mass attack strategy was moving enough force across miles of no-man's land with the necessary communications to sustain advances, coordinate and reinforce when the inevitable counter attack was mounted. Captain, with a raised hand: "Only a minute to go". The troops stand up. Short ladders are put in place to climb the trench. "Fix bayonets". The officer drops his hand. They climb, charge into withering fire, and whether or not the attack is successful the casualties are appalling. BY 1918, the Germans mounted four great offensive drives in an effort to break the cycle of stalemate created by the trenches. They were able to enhance their numbers by bringing troops to the west from the eastern front when Russia withdrew from the war after their Bolshevik revolution. They concluded that barrages should be shorter, more intense and follow with a surprise attack. The long, several day artillery attacks eliminated the element of surprise. They trained special assault troops, "storm troopers", to attack front lines and when necessary bypassed the enemy machine gun nests to continue their advances. In the same year, General Pershing had used this by pass tactic successfully at St. Mihiel in combination with an overwhelming mass attack to beat the German enemy. The success of the Americans was deemed a vindication of the Pershing strategies. The Germans did not solve the enemies inability to sustain the gains against defensive, German reinforcements rushed into the trench lines. The trenches were still the roadblock. In this respect , there was an assist from the tanks despite their mechanical faults and limited use.The tanks first sitings in 1916 at the Battle of the Somme created temporary panic in German trenches. Almanac of World War I. The University Press of Kentucky, Lexington 1998. American Military History. John Whiteclay Chambers, Ed. Oxford University Press, NY1999. Atlas of the First World war. Gilbert Martin. Oxford University Press, New York 1994. England, Peter. The Beauty and the Sorrow. Alfred A. Knopf, NY 2009. Stone, Norman. World War One, A short history. Basic Books, NY 2009. The United States in the First World War. An Encyclopedia. Ed. Anna Cipriano Venzon. Garland Publishing, Inc. NY & London 1995. World War Almanac. David R. Woodward. Facts on File, NY 2009.